Deep fried onion rings are one of my guilty pleasures. I don't make them often, so they are a real treat when I do. Serve them along with grilled steaks, burgers, or sandwiches. 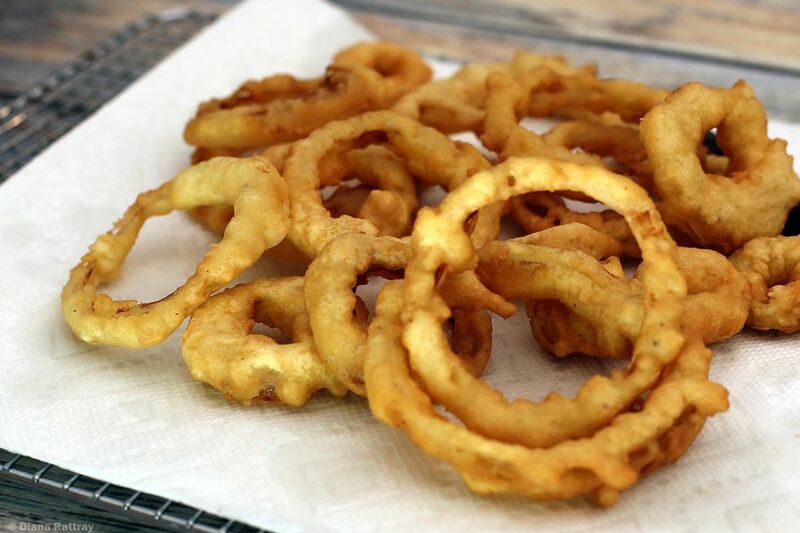 And crispy fried onion rings make a great burger or pulled pork topping. Large sweet onions, like Vidalias, are perfect for onion rings. This batter makes an excellent coating on the onion rings and it can be seasoned with a dash of your favorite seasoning blend. I like to add a salt-free Cajun seasoning to the batter. If your seasoning contains salt, reduce the amount of salt in the batter. These beer battered onion rings are another excellent option. Heat the oven to 200 F. Line a baking sheet with paper towels and have a spare baking sheet or pan ready for keeping the fried onion rings warm. Wash and peel the onions and then cut them into 1/4-inch thick rounds. Separate rounds into rings. Heat 3 to 4 inches of vegetable oil in a deep, heavy pan or deep fryer to 365 F.
In a bowl, combine flour, seasonings, and baking powder. In a small bowl, whisk together egg and milk. Add milk mixture to dry ingredients. Stir until well blended. Dip onion rings into batter, then drop into deep fat at about 365. Work with just a few at a time; don't crowd them. Fry the onion rings until they are golden brown, turning to brown both sides. Each batch will take about 2 to 3 minutes. Remove the onion rings to the pan with paper towels to drain thoroughly. Transfer them to another pan and move them to the preheated oven to keep warm while you make subsequent batches. They will stay crisp for about 20 to 30 minutes. Once all of the onion rings have been fried, serve immediately. Seasonings may be added to the batter. Replace some of the salt with Creole or Cajun seasoning or a seasoned salt blend. Or, add about 1/2 teaspoon of garlic powder to the batter. Onion powder and paprika would be good choices as well. Make sure the oil has reached 365 F before adding subsequent batches. Keep batches small and don't crowd. The oil will take longer to come back to temperature if too many pieces are added at once, resulting in an oilier coating on the onion rings.